Palaephatus, a contemporary of Aristotle, sought to reinforce belief in the historicity of ancient heroes by tracing the evolution of "actual" events into marvelously embellished myths. 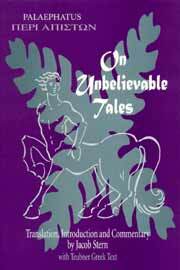 On Unbelievable Tales is an early effort to rationalize oft-told tales of the heroes and monstrous creatures of Greek mythology. It will also appeal to general readers with an interest in mythology, religion, and the history of rationalism.